Along with Santas, elves, and reindeer, angels make a big appearance this time of year. And yet unlike many of the other characters associated with the holidays, angels aren’t Christmas-specific. In fact, as a new book points out, they are fascinating beings whose presence in the Bible can point us toward a fuller understanding of God’s work. 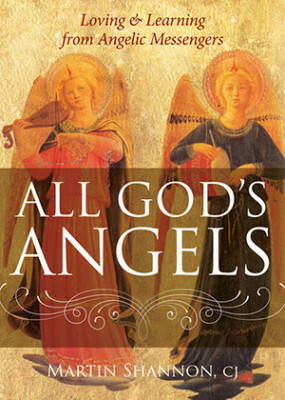 All God’s Angels: Loving and Learning from Angelic Messengers (Paraclete Press) is one of the loveliest books to cross my path this year. Each short chapter focuses on an angel story from the Bible, everything from Genesis to Revelation. In pithy, wise reflections, author Martin Shannon meditates on each story and what it reveals about angels, about God, and — ultimately — about our human selves. I love the approach; I’ve never before read these Bible stories and thought about the angels as anything other than peripheral figures, so I found the new perspective fascinating. 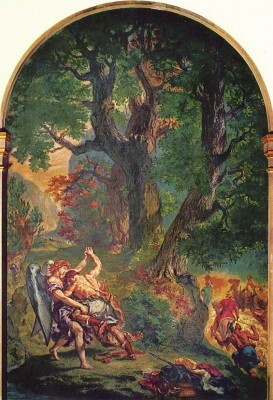 Each chapter is illustrated by a colorful reproduction of a work of art, everything from a Byzantine mosaic of the angel guarding Eden to Eugene Delacroix’s famous picture of Jacob wrestling the angel. These pictures are powerful complements to the chapters, particularly because Shannon also comments on the artwork, pointing out little details that help emphasize the mood and meaning of the story. Between the words and the art, this book is a glorious celebration of these mysterious beings who end up on our Christmas trees and coffee mugs but whose history and involvement in salvation is so much more rich than it seems. It’s a lovely, inspiring little book and would be a great Christmas gift for anyone looking for a dose of inspiration. And if you want to fully immerse yourself in all things angelic, read the book to the strains of this lovely song. It’s one of my favorite carols of all time, courtesy of John Rutter and the Cambridge Singers. This entry was posted in Mmmm .... books, Uncategorized. Bookmark the permalink. Thank you, Ginny, your post and Angel’s Carol was perfect medicine for my soul.